Cunnamulla, a rural town, is 700 km west of Brisbane and 100 km north of the New South Wales border. It is on the east side of the Warrego River, near the junction of the Mitchell and Balonne Highways, and is the administrative seat of the Paroo Shire. The New South Wales Surveyor-General, Sir Thomas Mitchell, explored the upper reaches of the Warrego River in 1846. His second-in-command, Edmund Kennedy returned the following year and further explored the Warrego River plain. Kennedy reported favourably on the district's prospects, but little settlement followed: there was plenty of unoccupied land closer to Brisbane, while the gold discoveries in the southern states in the early 1850s attracted attention elsewhere. 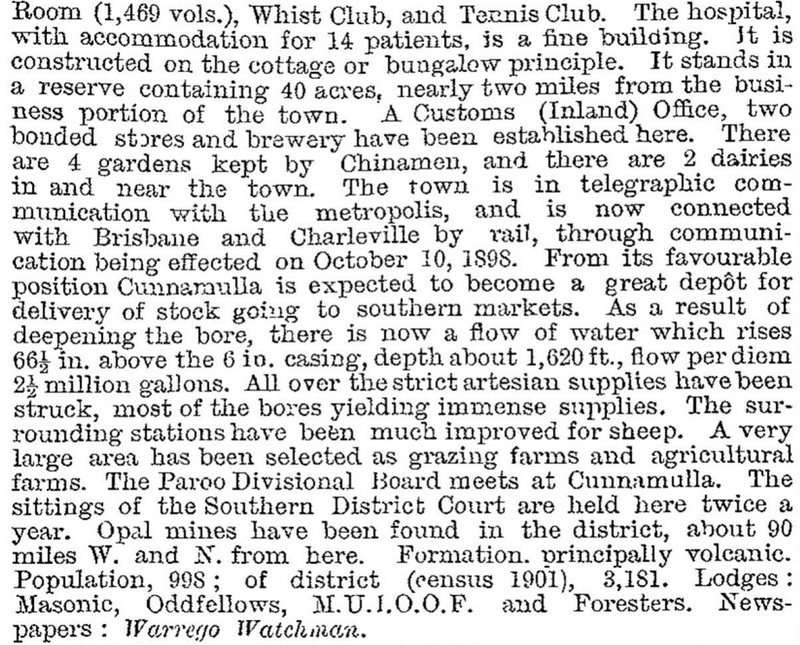 A further report on the area by William Landsborough following an 1862 expedition triggered an inflow of settlers and entrepreneurial graziers. Following Kennedy's advice as to a reliable waterhole on the Warrego, Samuel and Thomas Smith took up their Harriman pastoral run thereabouts soon after Landsborough's expedition. The Smiths sold out to Cobb and Co, which renamed the place Cunnamulla, an Aboriginal expression of uncertain meaning, but possibly describing the Warrego River. The waterhole became a convenient stopping place, on the intersection of stock routes, with a shanty and rudimentary settlement by the mid-1860s. A town was surveyed and a court house opened by 1869. Eight years later a primary school opened. 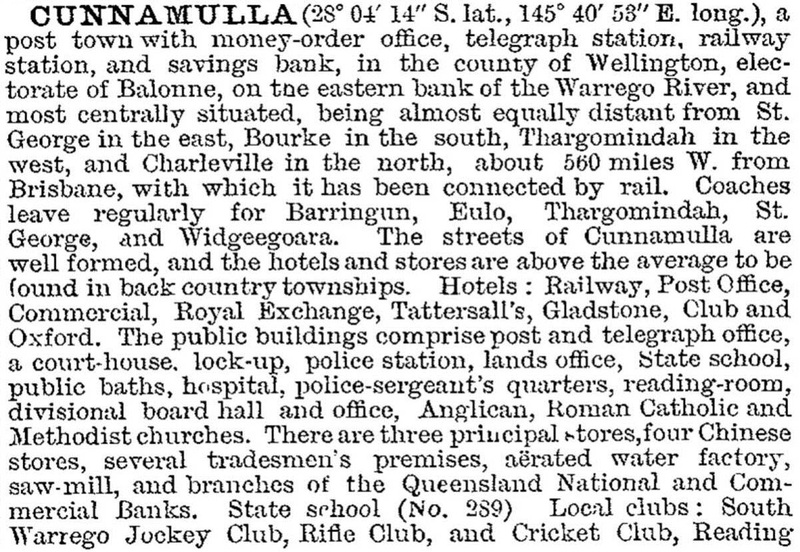 By 1880 Cunnamulla had a population of about 200. A newspaper, the Cunnamulla Express, was operating by 1884 together with several local industries including a cordial maker, brewery, soap manufacturer, bakers and blacksmiths. Civic improvements followed: Paroo Shire offices (1879), the first Warrego Pastoral Society' show (1882), a hospital, Anglican and Catholic churches (1896, 1898) and a railway extension southwards from Charleville (1898). Several of the large surrounding pastoral stations were resumed for closer-settlement during this period. Cunnamulla had been the junction of major stock routes – St George to Thargomindah and Charleville to Bourke – and the extension of the railway from Charleville in 1898 cemented its role as a regional centre in south-west Queensland. A successful artesian bore was drilled at Cunnamulla in 1889, and in a short time artesian waters were tapped at numerous places. Although drought brought pastoral devastation, stock losses were contained with the use of bore water. By 1900, however, a general decline in the flow from most bores was evident and by 1950 over one-third of the bores in Paroo Shire had ceased to flow. Fortunately the Cunnamulla bore was stable, maintaining the town supply reticulated in 1896. Situated in a sheep grazing area, Cunnamulla's economy very much rode on the sheep's back. The postwar years saw a conjunction of good seasons and high wool prices and the town experienced unprecedented prosperity. A swimming pool was built, a secondary department was added to the school and a hostel opened for secondary students. A new civic centre was opened in 1960, and the shire hall was replaced in 1971. By then the pastoral boom had passed, and the wool reserve price scheme was introduced in 1973 to save the industry. Despite its fundamental economic importance, wool was falling out of fashion as a regional emblem, even as early as the late-1960s. The Yowah opal field, 140 km west of Cunnamulla, on the edge of the shire, and the Eulo opal field inspired the annual Cunnamulla/Eulo Festival of Opals begun in 1967. Population decline has mirrored wool's decline: Cunnamulla's population in 1961 was over 2200 – by 2001 it was about 1350. The wool boom, though, has left the town with solid postwar civic infrastructure, making Cunnamulla a well-appointed regional township. It has a hospital, airport, showground, racecourse (four meetings annually), a golf course, a swimming pool, a Catholic primary school (1915), three churches and several hotels and motels. There are also the Paroo shire offices, two museums and a tourist information centre. The war memorial fountain (1924) near John Street, the pressed-copper Paroo Shire honour board (1918) in the civic centre and the Robbers Tree (where a bank robber was captured in 1880) are on the Queensland heritage register. Sculptor Archie St Clair was commisioned to produce a double life size monument, 'The Cunnamulla Fella' (2005), based on the song by Australian music legend, Slim Dusty. Cunnamulla holds the annual Cunnamulla Fella Festival. The statue of the anonymous Cunnamulla Fella, wide-brimmed hat on his head and a mug of tea in his hand, sits outside the shire hall. At the 2011 census, Indigenous people comprised 33.9% of the residents.